Support animals on aircraft in the US is common and JetBlue is joining a raft of other US carriers that are making changes to their policies following odd reports of a bizarre variety of animals being claimed as support animals - including peacocks and snakes! 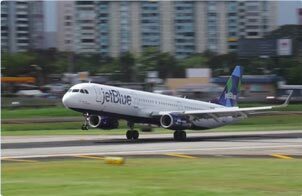 JetBlue announced this week that from 1st July, it will require customers to submit forms from a veterinarian vouching for the animal’s fitness and vaccinations if they want to take the 'support' animal on one of the airlines jets. Customers will be required to give JetBlue at least 48 hours in advance notice if they want to travel with a support animal. Customers will also have to accept liability if the animal hurts someone or damages property. This liability clause is rather similar to one introduced by United Airlines recently and also the tougher than wording deployed by Delta and American on their support animal policies. One of the major reasons the US has seen a major increase in support animals on flights is the fact that airline pet carriage fees are waived for support animals, plus support animals need no special training. The US government is now said to be considering new restrictions to curb the soaring numbers of animals in planes.